"And these visions of Johanna, kept me up past the dawn." - Bob Dylan, 1968. Rob (Conneely) on one of the few George Greenough shaped stand-up boards. Angourie, 1970. The Australian Surfer's Journal, Volume 3 Number One , Summer 2000. Page 33. First printed in Tracks magazine,circa 1971, reprinted in Nat-History, page 107. Speed Board : post World Championships (Johanna,Vic) standard settles at 6ft 2" to 7 ft 2" X 18 - 19 1/2", foiled template and deck with down rails at the tail. Mostly pin noses but down rails, tails and fins appear in a multitude of designs. The most significant design development resulting from the 1970 World Contest was not a return to longer board lengths, but the introduction of the down rail. Indeed, US surfer/shapers returned to the States and expanded the small wave riding capabilities of the shorter board with the application of Twin fins. A feature of the Side Slipper, by 1972 the down rail was adopted by the worlds major shapers and its use continues as of 2006. Low rails are a new thing and they are working really well. Eliminate rolls as much as possible in a low rail board. Use a slight roll if any, as too much roll on the bottom or top shape and it will make you fly away and spin out. Flats, curves and straighter lines are essential. The low rail board eliminates paddling problems and this to me is a breakthrough in design. We can paddle as long as we like once again. Faster re-entries from top to bottom without bouncing. Everything is combined into one; you're tighter, your inside further and your moving faster, when you feel like it. You're skimming instead of slapping. It's a freer feeling than before. Average length for this board, depending on your age, build etc. is from 5'8'' (mainly young children), 6'3'' (older than young), (Aust. design). 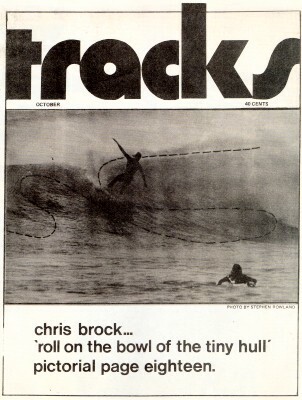 Surfing World Magazine Volume 14 Number 4 circa 1971 Page 13. Advertisement: Morey Pope "Power Dude", The Fun Co.
Quite a treat seeing an old Dude. I designed it in 1969 at Saticoy, east of Ventura, along with the “Big Mac”, two very hot boards for the time. Richard Deese was the shaper, and Morey did a many hundreds of them. The template was gunny, because the Big Mac was so hot-doggy and short, they were designed to be a pair. With the reduction in board volume, experiments continued to attempt to reduce weight. Many manufacturers used glue line stringers in their blanks and glassing techniques became more refined. Developments included 'dry' laminating, a minimal filler coat, textured decks, elimination of the gloss coat and a reduction in the width of the rail overlap. "A resin glue-up is the rough blank cut in half, resin applied to both sides of the cut, then clamped back together, this method considered to have a slight advantage over the completely stringerless because it will hold the turn-up shaped into it for a useable life-time. ... a dry glass job ... the resin ... is sparingly worked out with a squeegee leaving only enough resin for proper saturation of the cloth and securing a good bond to the foam, here the glasser has to be very careful of drain-outs (little air bubbles in the weave) which becomes weak spots when the resin has cured, sometimes the cause of stress cracks, drain-outs are more noticeable in tinted glass jobs. Another way to save a couple of ounces is, a small rail lap, you may have noticed over the past three years the decrease in the size of rail laps, once anything up to three inches was quite standard now three-quarter inch is normal with some manufacturers using the diminishing lap on the bottoms of their boards." Surfing World Magazine Volume 14 Number 4. Pages 69-70. circa 1970. Backyarder: similar dimensions as above but with a lack of commonly accepted design. 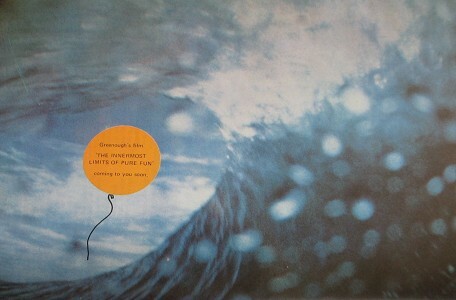 Easy access to materials and sixties creativity turns every second surfer into a designer/shaper. In Victoria, forced by limited finances, Ronnie Goddard shaped and glassed his first board in 1970. A single fin, 5 ft 11'' x 17'' with slight belly concave and flat in the tail. The board featured a Gun template, reflecting some influence from the visiting US/Hawaiian surfers. The blank was acquired cheaply by stripping and re-shaping an osbsolete Malibu board - a common method of the period. ("Backyard Butchery"). On returning to Maroubra in late 1970, Ronnie began manufacturing a small number of boards for friends and locals. Simply signed ''Goddard'' (ink on rice paper decals) the materials were purchased in kit form. The supply company, in Day Lane, Kensington, also offered suitable shaping and glassing bays. - Details from pesonal interview, Scott Dillon's Legends Surf Museum, Coffs Harbor, June 29th 2005. 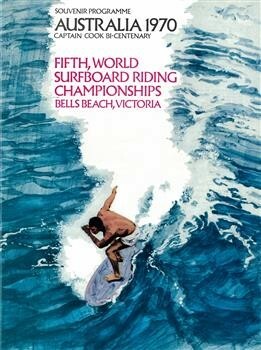 Surfing World 1970 Volume 14 Number 2. Interviews: Ben Aipa, Gerry Lopez, Corky Carroll, Mike Purpus, David Treloar. 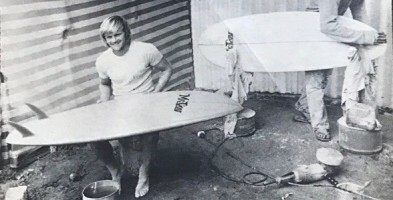 Nipper Williams Surfboards, featuring Terry Fitzgerald and David Treloar. 1970 Volume 14 Number 2, page? Surfer Magazine Volume 11 Number 2 May 1970, pages 27 and 29. Terry Fitzgerald and Col Smith photographs at Kirra riding very short Twin fins. 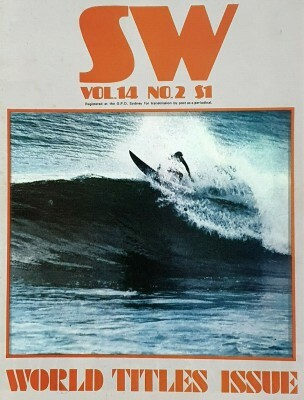 Surfing World Volume 13 Number 5 1970. Midget Farrelly: Who's Who in Hawaii- Eddie and Clyde Aikau, Buzzy Trent , Jock Sutherland , Jerry Lopez , Ben Apia , Barry Kanaiapuni and Joey Cabell. Bob Evans: Sunset- "Bob Pike was the first Australian to really ride Sunset. ", 6 pages. Honolua Bay, Maui - Nat Young and McTavish, 7 pages. John Arnorlds Surf Shop . Greg Noll Surfboards, Ben Aipa shaping. Keyo Surfboards, Geoff McCoy, Col Smith and Nat Young shaping. Fins usually have no rovings. Wallace Surfboards - The Junior. Fabric Mat 4ft 6" X 24" popularised by George Greenough (USA). Early model by Hodgman (USA). Twin Fin I US import (Corky Carroll, Mike Eaton , Rolf Aurness and David Nuuhiwa) by Tom Hoyle at Bennett Surfboards. Quickly dominates 50% of the Sydney market, notably McCoy Surfboards and Terry Fitzgerald at Shane Surfboards (The Shoe). 5 December 1970, page 33. SURFBOARD, Bennet 7' 10" few dings replaceable fin, $45. SURFBOARDS used 5'10" to 8' for $30. Purple Eye Surf shop, Ampol Bld, Canberra Ave, Fyshwick. Wilderness 5' 10" $55. San Juan 6ft $60. Shane' 7'6" $55. Bennett 8' $35. Keyo 8' $35. Purple Eye Surfshop, Ampol Bld, Canberra Ave, Fyshwick. 5'6" Woods $70. 5'5" Woods $70. 5'8" Shane $98. 5'8" Dillon $90. 5'8" Sam Egan $90. Purple Eye Surfshop, Ampol Bld, Canberra Ave, Fyshwck. SURF board in excellent condition, 9'6, ideal for beginner, $30. SURFBOARDS. Joe Larkin, direct from Qld. 15 new boards ranging from 5'4" - 6', largest range in Canberra at discounted prices, twin fins also available. Enquiries phone 951204, all weekend. SURFBOARD. Scott Dillon, 6' 10" roundtail, 12 months old. $50. SURFBOARD, Baron, 7ft l0 in, Tracker, excellent S Coast, $35. Mark Warren and McCoy Twin fin, Single Fin Egg in the background. Tracks December 1970, Number 3 page 14.